Huge shout out to my cousin Diana for being a fantastic host on my recent trip to Seattle. Feel free to use my travel notes as a guide for your future visitors (including myself!). I took a leisure walk to this place on my first full day. I ordered a coffee ((Pantheon 2018, pour over) and did some people watching (so much to see!). On my last day I went to the shop again and got some freshly roasted beans (also Pantheon). They of course also have food options, tons of coffee (made with your favorite brewing method) and plenty of Starbucks Reserve goodies. I can't wait for the NYC roastery to open up soon. Best place to enjoy a bit of sun (on those sunny days in Seattle, lucky me!) and people watching. and also a great place to snap a pic of the Space Needle. I haven't listened to this specific playlist but the date range matches when I visited the fountain. 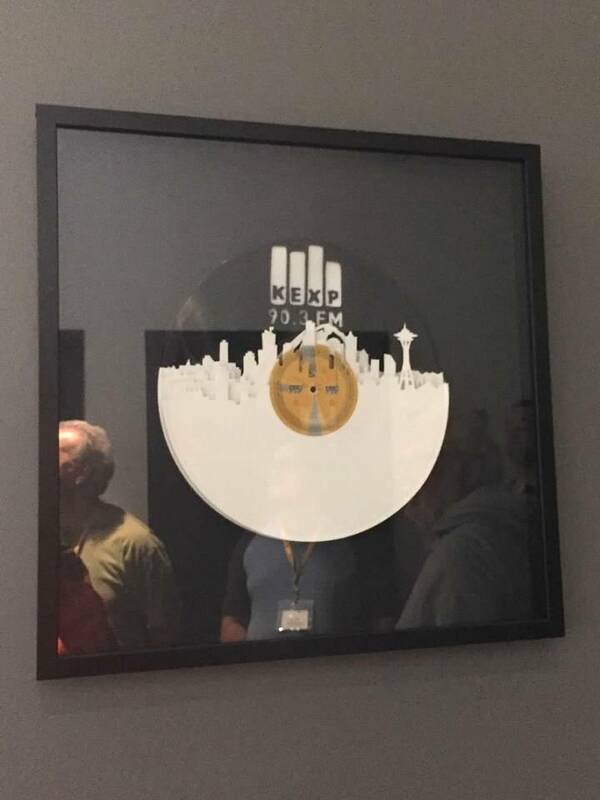 Having listened to KEXP live in studio performances podcast, I was intrigued by the station tour and also the setup of the space. They have a rotating coffee place and also a record store in the lobby. The tour was clearly well-advertised because we had people from all over the world (including Scotland and South Africa). I haven't watched too much of their youtube channel but it is also very popular around the world. The actual studio had glowing, pulsating blue LEDs that are surprisingly calm (note for my future lighting project, ha). I was really impressed with the massive CD library. Each CD also had personalized notes from the DJs. The collection is already being digitized and everyone was relieved to hear that the CD notes will also be scanned and stored as part of the effort. The space had a lot of neat artwork, this one showing the skyline of Seattle was my favorite. Earlier this summer I went to the Grand Canyon and caught the national park fever. Given Seattle is so close to several national parks, I had to visit one! After searching, I found a tour group called Evergreen Escapes and went on a small group tour to Mt Rainier. We got lucky with the weather and had possibly one of the best days ever for hiking. We were surrounded by beautiful colors of the fall and also amazing old growth trees/forests. I'm glad I took this tour closer to the beginning of my trip (since I traveled from East coast and still woke up at 3am on my first few days in Seattle). The tour specs included a round trip from downtown in a comfortable van. Our tour guide also provided water, snacks, and lunch so we didn't have to bring much. I would definitely do this same trip (perhaps a diff season) and other outings with this company again. 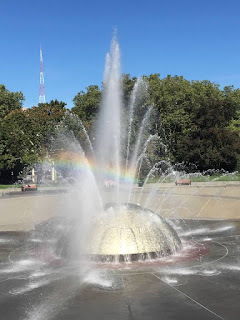 I went on this highly recommended tour when I first went to Seattle but my cousin Diana hasn't experienced it yet (because tours are for tourists, not locals)! We joined a bunch of people during a weekend session and had fun walking around underground and looking for purple glass (skylights). If you go on this tour, you will be causing sidewalk traffic jams like proper tourists. I enjoyed the storytelling part of the tour more so than the so-called 'relics' and 'artifacts' but decide for yourself! On the last full day of my trip, I woke up to a gray and rainy day. I skipped my plans for the zoo/garden and ventured out to Fremont for a chocolate factory tour instead. The tour gave a description of the bean to bar process, a peak inside the factory through clear observation room, and of course chocolate samples. I picked up some bars at the store afterwards. Jamjuree Thai - We had 3 dishes family style. Worth the climb from Capitol Hill station.... Be sure to check out the Space Needle sunsets while walking downhill (I didn't take a photo though). Cook Weaver - I loved the kelp/chanterelle mushroom dish. they also change menus frequently so I have to check back next time. It's also next to a cool coffee Joe bar with giant windows which I didn't get a chance to check out. Filed for next time! Bok a Bok Chicken - We saw a sign and decided to try it (after my initial pick didn't work out). best decision ever. Just great fried chicken sandwich. Annapurna Cafe Indian/Nepal/Tibetan. Everything smells amazing here. I tried lamb curry (medium spicy) which was tasty. 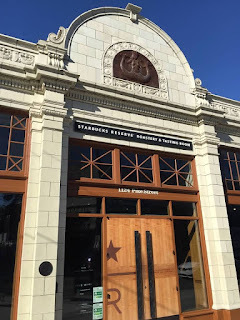 https://www.elliottbaybook.com/ marking it for next time to hopefully join a book event/author talk/reading. ORCA transit card https://orcacard.com/ (It took me a while to figure out the tap in / tap out thing. mainly due to lack of turnstiles blah). I used Citymapper app mostly to figure my way around town. Try out one of the Seattle Free Walking Tours. Stuff I watched/listened/played/sang while in Seattle. More of a time capsule for me than anything else. Thank you for the food and hiking tour recommendations. Tracy and I did not get a chance to see Mt. 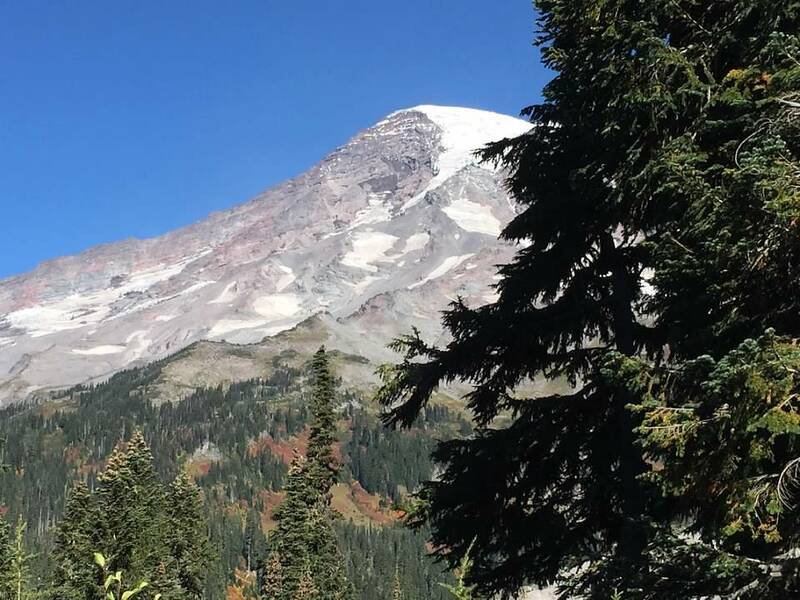 Rainer when we went. Food recommendations look fantastic! Hopefully we can meet up with you the next time you go.